Издание адресовано деятелям музыкального театра, композиторам, либреттистам, музыковедам, педагогам и студентам музыкальных вузов, широкому кругу поклонников оперного искусства и почитателей творчества Ф. Достоевского. The series of books includes the compositions of a playwright Yuri Dimitrin “The selection” in five books. The fourth book is dedicated to the author’s experience of composing opera libretti based on the novels of F. Dostoyevsky (“The Brothers Karamazov”, “The Idiot”, “The Possessed”). 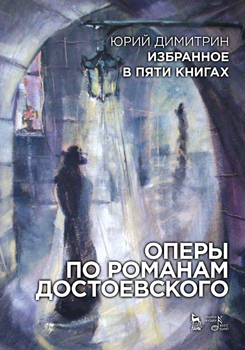 In the appendix of the book there are materials on the play of the Mariinsky Theatre “The Brothers Karamazov” (2008). The book is intended for the musical theatre performers, composers, librettists, music experts, the teachers and students of art academies, for a wide range of the enthusiasts of opera and the admirers of F. Dostoyevsky’s works.